Marking the tenth anniversary of the UASA establishment, the General Secretariat issued the UASA booklet for the period 2007 - 2017. 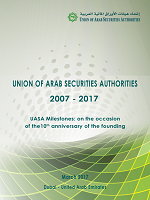 The publication of this booklet was made to shed light on the major milestones and development stages of the Union of Arab Securities Authorities (UASA) including its establishment and the most important achievements, its committees and task forces, as well as an overview of the UASA's Strategic Plan for the years 2016 - 2020. The booklet also presents the most important activities of the Union, particularly those related to capacity-building, conferences and seminars, publications, and international cooperation. The booklet also contains a list of the UASA members and their joining date, and the Authorities which took over the presidency of the Union since its establishment. It is worth mentioning that the UASA establishment was based on the initiative of the Securities and Commodities Authority - UAE with the aim of creating a professional mechanism that helps promoting development and Arab economic integration to pursue harmonization and compatibility of laws and regulations applied in Arab financial markets. In addition, upgrading legislative and regulatory level of such markets in a manner that would achieve fairness, efficiency, transparency and exchange of information expertise among UASA members, and the development of capital markets oversight standards, to maintain efficiency to facilitate the cooperation in regulating general issuances of securities, and encourage listing and joint trading in the Arab markets. Furthermore, promote inter-investments and raise investment awareness in the Arab countries, as well as active participation of all UASA members in regional and international forums.